According to the social axioms framework, people’s beliefs about how the world functions (i.e., internal or external locus of control) are related to their social behaviors. Previous researchers have attempted to relate locus of control to gambling behavior, but the results have not been clear-cut. 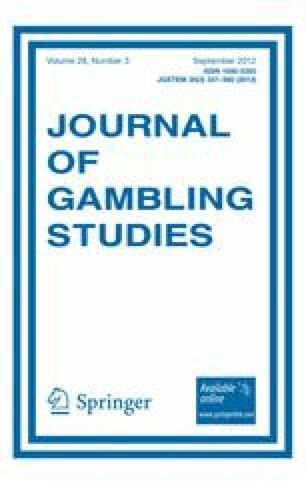 The present study speculated that the effects of perceived control (i.e., belief in luck and belief in skill) on gambling behavior are domain-specific and vary with the type of gambling. A total of 306 adult Macau residents ranging in age from 18 to 65 with casino gambling experience were recruited by going door to door. Empirical data on gambling frequency and perceived control relating to 13 types of gambling were collected. Our results demonstrated that the effects of belief in luck or skill on gambling behavior varied across different gambling categories. Specifically, for football lottery, Chinese lottery, and baccarat, it was not belief in skill but rather belief in luck that was a positive significant predictor of gambling frequency. Only for slot machines and stud poker did belief in skill significantly predict gambling frequency. For the remaining eight gambling categories, neither belief in luck nor belief in skill could predict gambling frequency. Our findings indicate that neither internal nor external locus of control can consistently explain people’s gambling behaviors. Instead, which factor plays a greater role in a person’s gambling behavior is dependent on the gambling type. Therefore, the finding that not all gambles are created equal might be a promising avenue for further research and treatment approaches. Kun Zhou and Hui Tang contributed equally to the article. This research was partially supported by the Knowledge Innovation Project of the Chinese Academy of Sciences (No. KSCX2-YW-R-130, KSCX2-EW-J-8), the National Natural Science Foundation of China (70871110, 71071150), and a grant from Macao Polytechnic Institute titled “A Study on Gamblers’ Behavior and Responsible Gambling”. We are indebted to the following individuals for their assistance: the respondents for their participation in the survey; the 21 research assistants from Macao Polytechnic Institute who assisted in data collection; Zhong-Fang Yang, Rui Zheng, Yan Sun, Jie-Hong Xu, and Yan-Ling Bi for illuminating discussions; and two anonymous referees for helpful comments on the initial version.